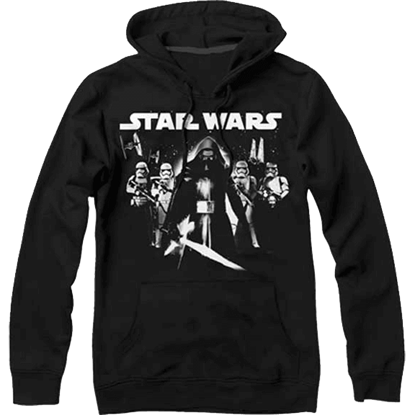 Show your love of Star Wars throughout the year when you add one of our Star Wars hoodies or sweatshirts to your wardrobe. Featuring scenes and characters from the space opera franchise, these hooded sweatshirts are warm and extremely comfortable to wear. 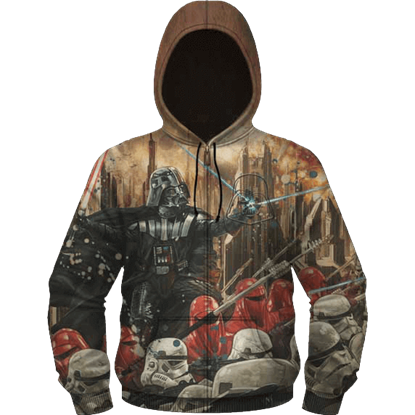 Your young Star Wars fan will love dressing up in one of our Darth Vader Sith Suit Hoodies, designed to emulate the Sith Lords armored outfit. Or perhaps the R2-D2 Astromech Droid Casing Hoodie is more your style, perfect for Halloween or everyday casual wear. 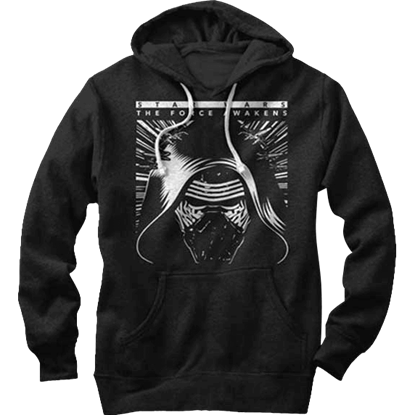 Fans of The Force Awakens can embrace the dark side of the First Order with either the Captain Phasma or Kylo Ren hoodies. 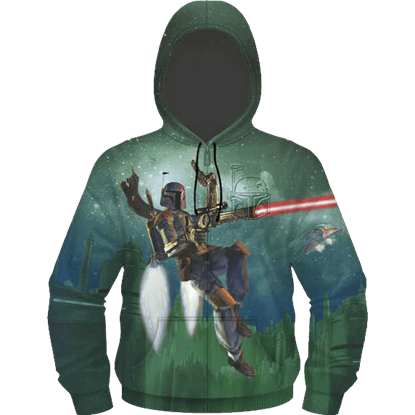 The Flying Boba Fett Embossed Fleece Hoodie showcases one of the most feared and respected bounty hunters. And for the holidays, the Darth Claus Fleece Sweatshirt makes a humorous alternative to festive sweaters. 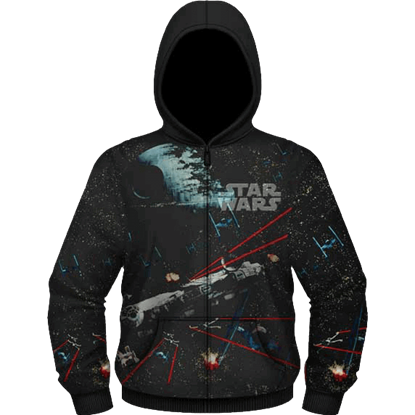 We add new styles to our Star Wars hoodies and sweatshirts as they become available, so keep checking back. One of the most feared and respected bounty hunters throughout the galaxy, Boba Fett is a fan favorite from the Star Wars saga. Stay warm and comfortable while you sport his likeness with the Flying Boba Fett Embossed Fleece Hoodie! Star Wars is such an action packed and intense saga that, sometimes, watching it can give you the chills! 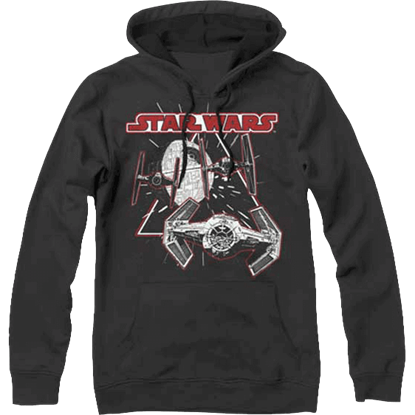 In those moments, the Imperial Attack Embossed Fleece Hoodie can keep you cozy while also sporting a scene from the films. When Leia asked if Luke was a little short to be a stormtrooper, we doubt that he looked THIS short! 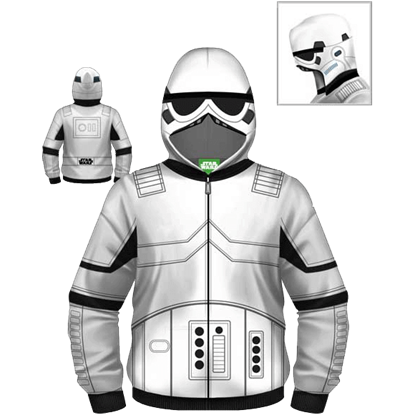 This Junior Stormtrooper Armor Hoodie allows any young Star Wars fan to take up the armor and look like a real soldier of the Empire. An evil Knight of Ren with a fiery temper, Kylo Rens armor inspires fear just as much as his status in the First Order does. Wearing your own version of this sinister suit is as simple as zipping up the Kylo Ren Armor and Helmet Hoodie! Nothing is more exciting than wearing an epic Star Wars starfighter battle scene on your clothing, and thankfully you do not have to give that amazing feeling up during the colder months with the Space Battle Embossed Fleece Hoodie! The long-awaited seventh Star Wars installment The Force Awakens tells the story of the Resistance battling against the First Order. This Star Wars First Order Assemble Hoodie displays the group that was inspired by the Galactic Empire. Why should your love of Star Wars leave your wardrobe just because the weather turns chilly? With the Star Wars Starfighter Hoodie, you can remember your favorite interplanetary battles while staying toasty in a fleece sweatshirt. Just in case it gets chilly on the dark side of the Force, make sure you always have a soft and comfortable hoodie to keep you warm! 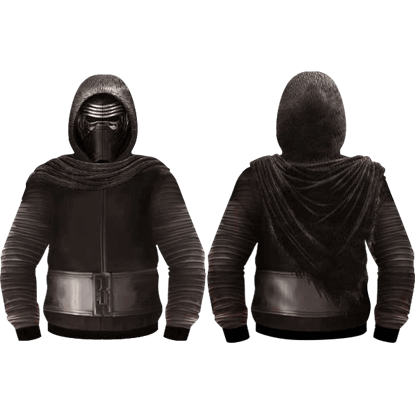 The Force Awakens Kylo Ren Hoodie features one of the most sinister villains from the First Order.